The cows we had on the farm growing up were sweet and mostly gentle beasts. We, of course, named every pretty one. This cow reminds me of our cow, Elsa. 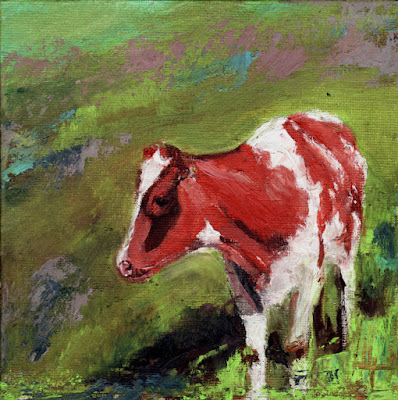 The photo was from another daily challenge and there was a second cow in that photo but while painting her she kept looking like she was making faces at me - so I painted her right into the pasture. I think a plum color in the pasture may have added a bit of zip/zing but the eye did turn out just as I remember them.